Answer 1 (a) The main steps of nutrition in humans are ingestion, digestion, absorption, assimilation and egestion. Question 5. What are villi? What is their location and function? Answer 5 In the inner walls of our small intestine there are finger like projections called a villi. 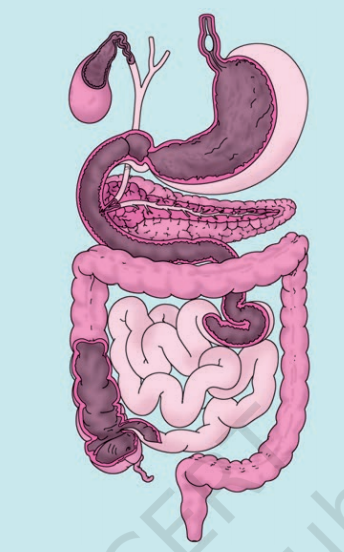 The function of villi is to increase the surface area for absorption of the digested food. The surface of the villi absorbs the digested food materials. Question 6. Where is the bile produced? Which component of the food does it help to digest? Answer 6 Bile is produced in liver which is stored in the gall bladder.The bile helps in the digestion of fats. Question 7. Name the type of carbohydrate that can be digested by ruminants but not by humans. Give the reason also. Answer 7 A carbohydrate that can be digested by ruminants but not by humans is cellulose.Ruminants have a large sac-like structure called rumen between the oesophagus and the small intestine where the cellulose of the food is digested by the action of certain bacteria which are not present in humans. Question 8. Why do we get instant energy from glucose? Answer 8 Glucose breaks down into carbon dioxide and water with the help of oxygen to provide instant energy to the body. Answer 9 (i) absorption of food small intestine. (ii) chewing of food buccal cavity (Mouth). Question 10. Write one similarity and one difference between the nutrition in amoeba and human beings. Answer 10 Similarity : In amoeba, digestive juices are secreted into the food vacuole. They act on the food and break it down into simpler substances. The digested food is then absorbed. Similarly, in human beings various digestive juices (mouth, stomach, intestine etc.) act on food and break it down to simpler substances.Both the organisms are heterotrophs. Humans have mouth and a complex digestive system. Pseudopodia help in capturing food and digestive system is simplex. Question 12. Label Fig. 2.11 of the digestive system. Question 13. Can we survive only on raw, leafy vegetables/grass? Discuss. Answer 13 We cannot survive by taking vegetables in raw form.Raw leafy vegetables and grass are rich in cellulose, a type of carbohydrate. Many animals, including humans, cannot digest cellulose, because they do not have enzymes and certain type of bacteria which can digest cellulose. We have to boil or cook vegetables which breaks down cellulose into simple carbohydrates.